How do I bypass payment for only certain people? I have a registration form with payment options through PayPal. There are some people (about 10) who will register, but not pay (they are Board members). How do I set that up without creating a new form? Am I asking too much? Can I create the conditional statement around what they enter into a text box? Yes, that would work. i also thought that I could use the email field and when certain addresses were inserted, create a hide/show with the free part. How do I then stop them going to Paypal? Would I need a 2nd submit button that only appears when a Board member registers? There are some options that you may try. 1. Email based conditions should be fine. 2. Alternatively, you may ask your members to not check any products on your registration form, so that they will not be forwarded to PayPal. 3. 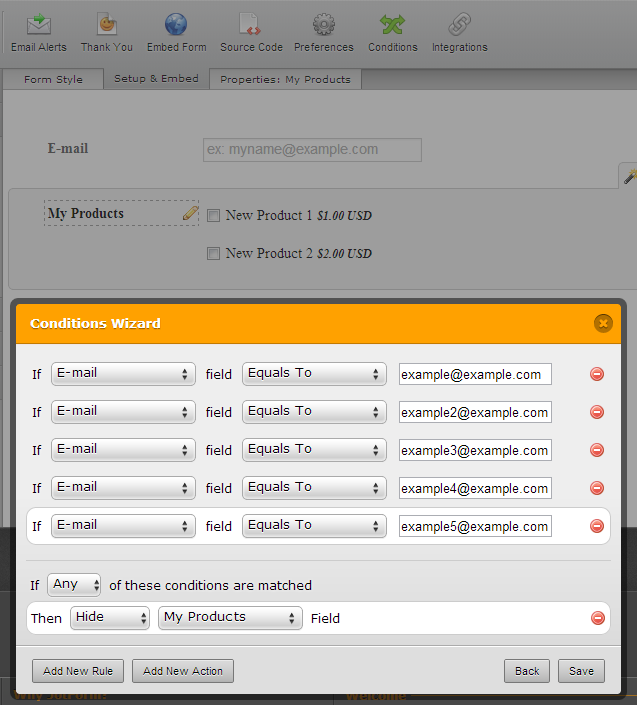 The last option is to ask them complete your form, but bypass PayPal payment stage. In this case submission will be forwarded to Incomplete Payments from where you will be able to manually "complete" them. Still not working for me. I have added a radio button asking if someone is a Board Member. It defaults to 'No'. Added conditional hide/show fields for when a board member identifies themselves. This is all good. I have set up an email response that goes to the board member specifically. it is separate from the one that non-board members get. However, the Board members are getting BOTH autoresponder emails. As I've check your form's autoresponder, I found out that both autoresponder Sender E-mail address is set to pdginc@me.com which I think the reason why your board members getting both autoresponder. I have added a radio button asking if someone is a Board Member. It defaults to 'No'. - If you don't like "No" as your default option, just simply click Selected Button and set the default to empty button. Thanks for your response. I had as indicated in my note aboute, already set the default to NO. Please expand on the sender email address being sent to pdginc@me.com. If not this, what should it be set to? OK, I've managed to get this to work, at least with my testing. Meantime, thank you for the hints that pointed me in the right direction! I love how slick these forms can be with a little work!